HÀ NỘI — Hà Nội ranking as the second-worst polluted city in Southeast Asia was inaccurate, according to deputy Minister of Natural Resources and Environment (MoNRE), Võ Tuấn Nhân. Environmental pollution often occurred in winter and early spring or in December, January and February and might last until March, Nhân told a Government meeting in Hà Nội on Tuesday. According to results from observation stations of the Environment General Department, and 10 automatic air observation stations of the Hà Nội Natural Resources and Environment Department and reference data of the US Embassy’s station, the PM2.5 level exceeded the allowed threshold in the first quarter this year, he said. “The pollution of superfine particles occurring partially in Hà Nội was real”, said the deputy minister. “The increasing pollution was due to traffic density, many construction sites, factories and garbage burning activities”, he said. Earlier this week, the 2018 World Air Quality and Greenpeace and IQAir AirVisual’s Report reported that Hà Nội stood second in Southeast Asia in terms of air pollution, just behind Indonesia’s capital Jakarta. The report was made with data from dozens of air quality monitoring stations across the world. PM2.5, also described as superfine particles, is a fraction of the width of a human hair, which is released from vehicles, industry and natural sources like dust. 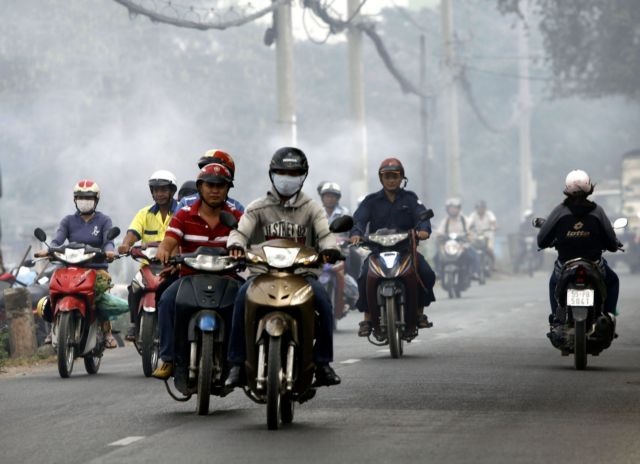 In Southeast Asia, Jakarta was the most polluted city with a PM2.5 level of 45.3 μg per cu.m. It was followed by Hà Nội with 40.8mg per cu.m. Nhân said the information was not accurate because the report just showed pollution results of 20 cities of four among 11 nations in the Southeast Asia. “So it was such a baseless conclusion”, he said. He admitted the city’s air was polluted and the municipal government had carried out measures to control the situation such as moving polluting factories out of the city. According to the Environment General Department, the air quality in Hà Nội in the first three months was at medium level. In outskirts areas or locations with many trees such as Long Biên, Mỹ Đình or Tây Mỗ, the air quality was good while the roads of Phạm Văn Đồng, Minh Khai or Hàng Đậu with dense traffic and construction activities air quality was at bad level. The PM2.5 level, which was measured daily, varied between 40-80 μg/cu.m. The level increased at rush hours, said the general department. The high humidity and fog slowed the air flow, so pollutants could not rise high in the atmosphere so the pollution was worse, according to the general department. In fact, pollution in Hà Nội and HCM City was not as bad as in many other Asian cities, per the department.